Moscow is one of the largest cities in the world, comparable in size to London, Tokyo or Mexico City. A cosmopolitan city that never sleeps, featuring a fascinating ethnic and cultural diversity, imperial grandeur and luxury in the centre, and gloomy residential areas in the suburbs. The dynamism of Moscow City gives rise to the relaxing vibes of Gorky Park, the grandeur of the Bolshoi Theatre to the pleasant modern art scene at the Red October factory. It would be no exaggeration to say that Moscow features people from most countries and ethnic groups in the world. Some arrive from within Russia or the former Soviet republics, others have moved in recently, attracted by the economic opportunities, and others seek refuge from the region’s many military conflicts. If you are from an ethnic minority background and come to Moscow as a visitor, especially during a celebration like the World Cup, you may be fascinated and overwhelmed by the city’s diversity and scope for positive experiences. The picture will be more complex if you live there. Official residence figures give an overview as to the ethnic mix of Moscow with the largest ethnic minorities being Tatars, Armenians, Jews, Ukrainians, Chechens, Dagestanis, Uzbeks and Tajiks. Moscow also features large Afghan, African, Chinese and Vietnamese communities. Some communities are more integrated than others, with many labour migrants from Central Asia receiving little sympathy or assistance to integrate, forced to live in very closed communities with the only integration opportunities coming via ethnic cafes and, unsurprisingly, public football pitches. 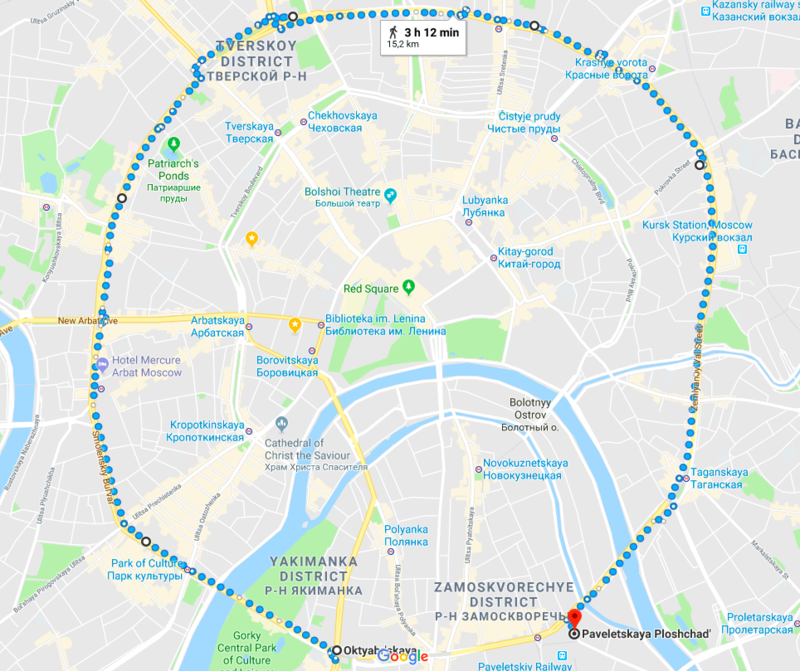 The central part of Moscow is considered to lie within two rings: the Bulvarnoe koltso (Boulevard ring) encompassing Red Square and the historic districts around it, and the Sadovoe Koltso (Garden ring). In the summer the wisest thing to do is explore the treats of the two rings on foot, crossing the Moskva river and enjoying its many parks. 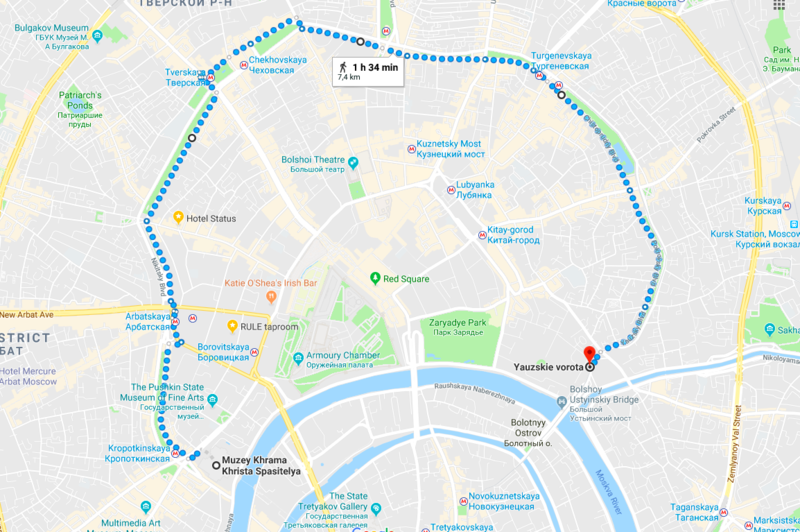 For a start, try walking along the legendary Old Arbat street, further to the Sadovoe koltso, Tverskaya street, Nikolskaya and Yauza river embankment. The founding site of the city, the Kremlin and Red Square are still at the heart of Moscow – historically, geographically and spiritually. Feel the weight of their significance as you wander within the walls of the ancient fortress, marvel at the mind-boggling magnificence of St Basil’s Cathedral and pay a visit to the tomb of Vladimir Lenin. The Russian Capital offers everything from insight into the former Soviet state’s Communist past for the history buff to exhibitions for modern art lovers, craft beer breweries and a thriving foodie scene. ‘Tsvetnoy’ mall with a night bar on the underground floor. VDNH open air exhibition complex, in the Soviet times meant ‘The Exhibition of Achievements of National Economy’ presenting latest trends from all Soviet Republics, the closest equivalent would probably be World’s Fair. Featuring a special exposition on the history of Russian football. ‘Lancheria Laflafel’ cosy Indian and Middle Eastern cafe with great vibe. ‘Golova’ bar with great cocktails and welcoming atmosphere. The Jewish community in Moscow is very active not just in community activities but also in terms of education and promoting tolerance. The Jewish Museum and Tolerance center on Obraztsova street, 11 in Moscow is one of the most modern and interactive museums, telling the story of the Russian Jewish community through history. 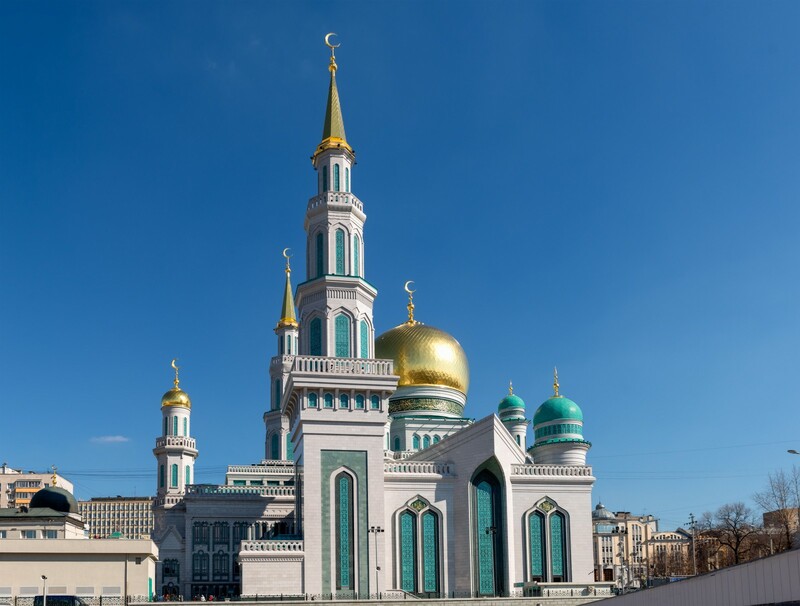 The number of Muslims in Moscow is estimated at around 2 million people, with a very developed infrastructure of Mosques, halal food cafes and clothing stores. The main Cathedral Mosque in Moscow at Vypolzov pereulok, 7 is one of the biggest in Europe. Many community organisations are active including the Islamic Cultural Center ‘Dar’. Some of the high street fashion for Muslim women by ‘Irada’, a brand run by two women, can be found at ‘Nautilus’ shopping mall at Nikolskaya street, 25. The most popular user-updated guide to halal eating places and infrastructure in Russia in several languages is https://en.halalguide.me. It reflects the city’s diversity that Muscovites prefer Georgian and Uzbek cuisine over anything else, and for good reason. Moscow features an enormous food scene from small ethnic cafes to luxury restaurants, but few can beat Georgian and Uzbek food. You will find lots of small quality restaurants – try the ‘Chaihona N1’ chain for Uzbek cuisine and ‘Dzhon Dzholi’ for Georgian cuisine. We love these places. For accommodation, the safest areas are within the Garden ring. Avoid going to remote districts beyond the ring after dark. The exceptions are Izmaylovo and VDNH districts that are considered safe with traditional tourist accommodation clusters and infrastructure. Organised attacks on visiting fans by Russian hooligan groups are less likely partly due to the preventive work undertaken by the security services, but the potential for spontaneous violence is still present especially if political issues or bad results of the Russian team are involved. Some Russian fans might perceive loud chanting and excessive drinking in public as an insult or provocation, especially if any reference to Russia is involved or the Russian team performs poorly in the competition. The threshold between verbal and physical confrontation is very slim in Russia and people might feel the violent reaction to be legitimate due to being ‘provoked’. Despite the apparent hardships, Moscow is still a magnet for migrants seeking new opportunities. Many choose to stay and navigate their way around the difficulties. People from Central Asia and North Caucasus are the most frequent victims of hate crimes, racial profiling and extortion by the police, something many sadly accept as a given in Moscow. Discrimination in the rental market in Moscow is another largely accepted evil. A recent study of Moscow real estate ads found that 16% contain a ‘Slavic only’ clause. Due to this and Moscow city’s high rental prices (comparable with London or New York), migrants are pushed out to the most depressing and challenging districts. Such districts include the southern, south-eastern and north-eastern parts of Moscow – Biryulevo, Kapotnya, Tekstilshchiki, Lyublino, Lyubertsy, Bibirevo, Sviblovo, Vykhino. The African communities in Moscow and Russia at large are not well organised, with their countries’ embassies often largely powerless or unwilling to help them. A very rough estimate suggests that around 100,000 people of black African descent live in Russia. Many face the harsh realities of Russia’s very strict migration legislation. Many Africans came as students during the Soviet period and stayed, their children have been born or joined them in Russia. There are also new migrants who arrived after the 1990s, some of whom were lured into coming to Russia having paid agents to obtain visas and promised employment contracts, including with football clubs, only to discover they have been victims of fraud, trapped with no legal status, no possibility of legal work and facing daily harassment and racism. Using the magnificent Russian metro system to commute anywhere has become a risk for many due to police profiling and extortion. There is no data to quantify the profiling, but a study by the Jurix legal organisation suggests that non-Slavic looking people are 22 times more likely to be stopped by police in Moscow. Many newly-arrived Africans end up with the only jobs available for them – giving out leaflets at transport intersections advertising fast food restaurants. Russia has notoriously strict and complicated migration legislation, at times this affects even youth football. Kids with a foreign passport are not allowed to play for teams in some official competitions due to a requirement that funding for competitions should benefit ‘Russian citizens’. They can train but not play official matches. No less worrying is Russia’s asylum registration. Reports suggest that since 2011 Russia granted asylum to only one refugee from Syria. The Afghan community, also fleeing war, amounts to an estimated 50,000 people in Moscow, centred around what became known as ‘Little Kabul’ – the Soviet era ‘Sevastopol’ complex in Southern Moscow. Racial profiling by police is also a very serious problem in Moscow. You are advised to carry your ID and city registration documents at all times. Hate crimes against ethnic minorities in Moscow are in decline in recent years but still represent a threat outside central Moscow. Don’t walk alone at night in remote areas outside the Garden ring and use only authorized taxi apps. Never take a taxi by waving a hand from the street. It is difficult to predict how people and the police in Moscow will behave during the World Cup, but the Russian LGBT+ community in daily life is limited in the rights available to publicly express their feelings, including walking or holding hands (more relevant for male couples as female couples holding hands attract less attention) or any other expressions of feelings that would be acceptable in public by heterosexual couples. This can lead to harassment or aggression against gays and lesbians. Despite assurances by FIFA and the LOC that LGBT+ people will be protected along with everyone else, usually in Russia the police may react to seeing a rainbow flag (for example, on the shoulders or on a belt). Less noticeable rainbow symbols (ribbon, bracelet or pin) most likely will not attract police attention. The ‘anti-gay legislation’ and climate it has created in society has empowered many aggressively homophobic people to simply approach those who they think look gay or display any symbols of the LGBT+ movement and physically attack them, facing little to no risk of being confronted by the police or prosecuted. LGBT+ people could also be verbally abused if they do not fit the gender conformity perceptions of others (feminine male behavior, transgender people). Be aware of the general environment and report immediately to the Fare network Whatsapp hotline at + 7 916 948 11 08 if you experience homophobia. Homophobic vigilante and Cossack groups operate in Moscow and could potentially threaten LGBT+ fans. A grocery store owned by Russian millionaire Herman Sterligov called ‘Bread and Salt’ is located at one of Moscow’s central streets. The store is known for putting signs in the store windows reading ‘No f*ggots allowed’, later changed to ‘No sodomites allowed’ after public pressure. In public places and at public events, it is always worthwhile assessing the sensibilities of people you are talking to. It is not advised to raise political issues or issues of human rights violations in Russia. Most likely your Russian interlocutor will take it personally or as a criticism. If you want to discuss the issue of equality and at the same time learn the opinion of your interlocutor, it’s better to discuss the experience of your own country. If you use dating apps such as Grindr or Hornet you must exercise caution. There were many cases of fake profiles luring people into meeting to humiliate, assault and subsequently blackmail them. Moscow has a small gay scene which survives comfortably alongside the wider picture of intolerance. The places listed below come recommended as safe and interesting. Take the usual precautions when here. There are several LGBT + organisations in Moscow that carry out activities for the community: campaigns, HIV/AIDS prevention, sports events, psychological and legal support. A community centre for LGBT+ people is functioning in Moscow. Sova Center for Information and Analysis – the oldest and most authoritative think tank monitoring racism and extreme nationalism, religious freedom as well as inappropriate application of anti-extremist legislation in Russia. Together with the Fare network, has produced annual reports on discriminatory incidents in Russian football since 2012. Listed as a ‘Foreign Agent’ by the Russian government on December 2016. Sakharov Center – exhibition on Soviet totalitarianism, human rights center and platform for various human rights initiatives. Civic Assistance Committee www.refugee.ru – one of the very few organisations providing legal support and assistance to migrants and asylum seekers in Moscow. MPC Social Services – community organisation attached to Moscow Protestant Chaplaincy, working with many African refugees and migrants providing social services and recording cases of hate crime against them in Moscow. Safe House Foundation – an initiative countering human trafficking. Moscow’s glorious footballing history was at the heart of the Soviet Union with Spartak, CSKA, Dinamo, Lokomotiv and Torpedo all sharing the affection of Muscovites. The most active fan groups are often dominated by violent far-right groups. These fans, often found situated behind the goal, have made it to the front pages of the local and international press for all the wrong reasons – monkey chants directed at black players and neo-Nazi symbols on their banners. From the mid-2000s to around 2013, far-right football hooligans launched frequent attacks on ethnic minorities outside stadiums, even inventing a practice they call ‘white wagons’ – attacking non-Slavic people on commuter trains. A government crackdown on these nationalist movements in the past few years has to be commended; numbers of incidents have reduced dramatically, and general levels of violent hate crimes also show signs of decline. Moscow has changed for the better in recent years, and the impact includes its football. Moscow clubs include a diverse following of peaceful and passionate fans who, unfortunately, largely keep silent in the face of discrimination from their ultras sections. It is reasonable to ask how supporters of clubs linked to the Red Army or deeply rooted in the Soviet traditions of workers’ clubs can be racist today, in a country that once defeated fascism. It began as a copy of Western European ultras in the 1990s, whose terraces then were covered in far-right symbols, and developed into Russia’s own brand of footballing hatred. The most frequent targets are black and ethnic minority players, people from the North Caucasus and labour migrants from Central Asia. Homosexuality is such a taboo topic that it doesn’t even come up often in offensive chants against opponents. Women’s football in Russia is rapidly developing but some of the perceptions, infrastructure and opportunities are still catching up. With only eight teams in the women’s top (and only) league in a country of more than 140 million people, there is a long way to go. The Russian women’s national team qualification for the UEFA EURO 2017 competition gave some cause for optimism. Consequently the Russian Football Union seems to pay more attention to the women’s game now. The top-flight men’s teams have also started to create affiliated women’s clubs, partly as a result of pressure from new regulations from UEFA requiring it for Champions League clubs. In Moscow CSKA and Lokomotiv Moscow are taking the lead. With grassroots pioneers like Moscow’s Girl Power football school showing what can be done, women’s football will become more popular in the coming years.